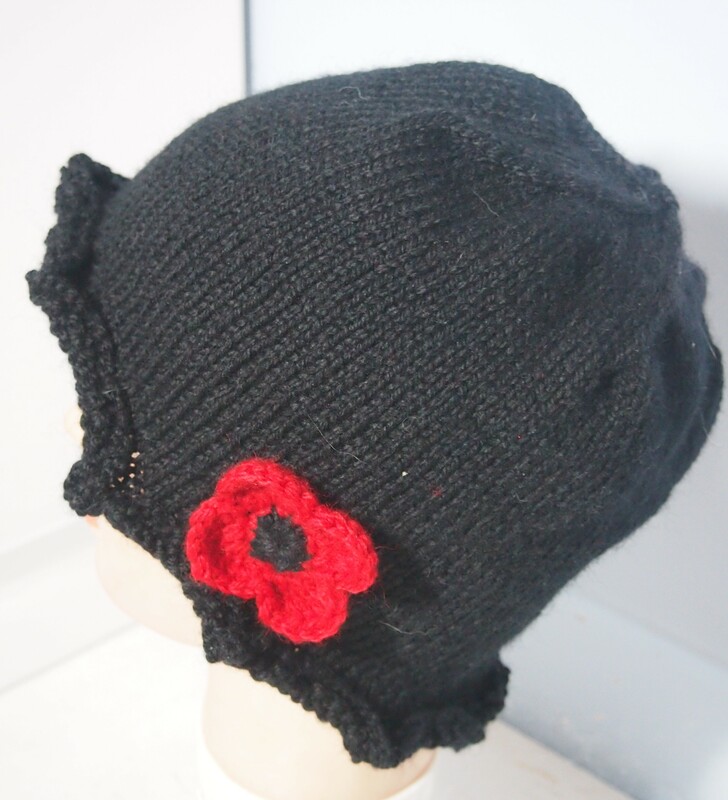 I had the idea for this Remembrance Day hat a couple of weeks ago. 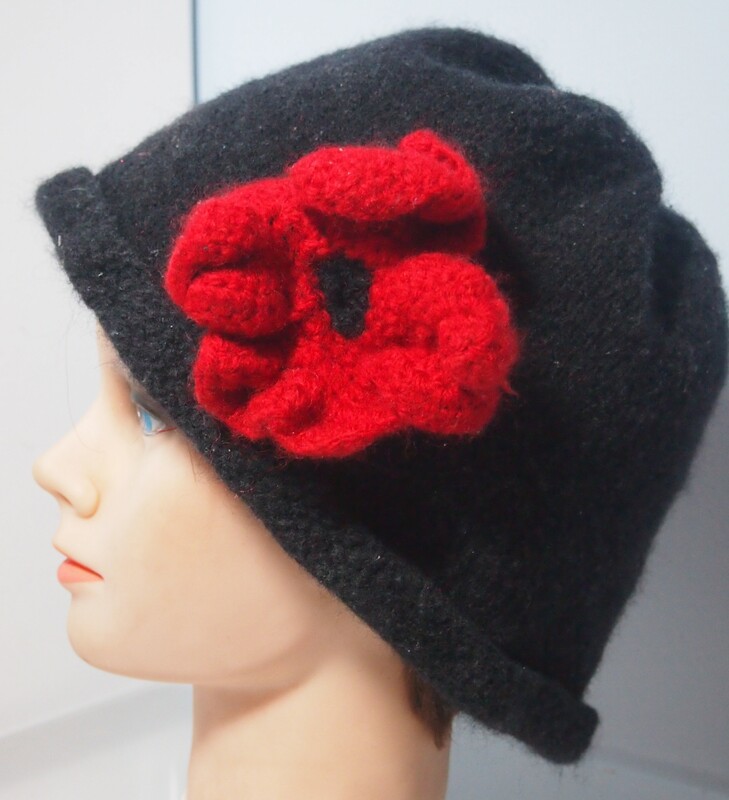 it was supposed to be a felted version of a twenties cloche with a crocheted poppy. I think I have discovered on Halloween and today why knitted felting was a short lived fad. Firstly a felted hat has at least 50% more stitches in it than a regular hat because of the shrinkage. Secondly, the washing machine turns into a real crapshoot. I spent the last couple of days off and on knitting the felted hat. I mapped it out on paper and used the (newly recovered) tension square that I had made and lost for the witches hat on Halloween to calculate the stitches. I knitted and knitted, and then put it in the washer and dryer. I got a pattern for the crocheted poppy from Treasures in Needlework by Mrs Warren and Mrs Pullan, 1870, and threw it in the laundry with the hat. This morning I got them out and found what I thought was a shapless, unusable mess. 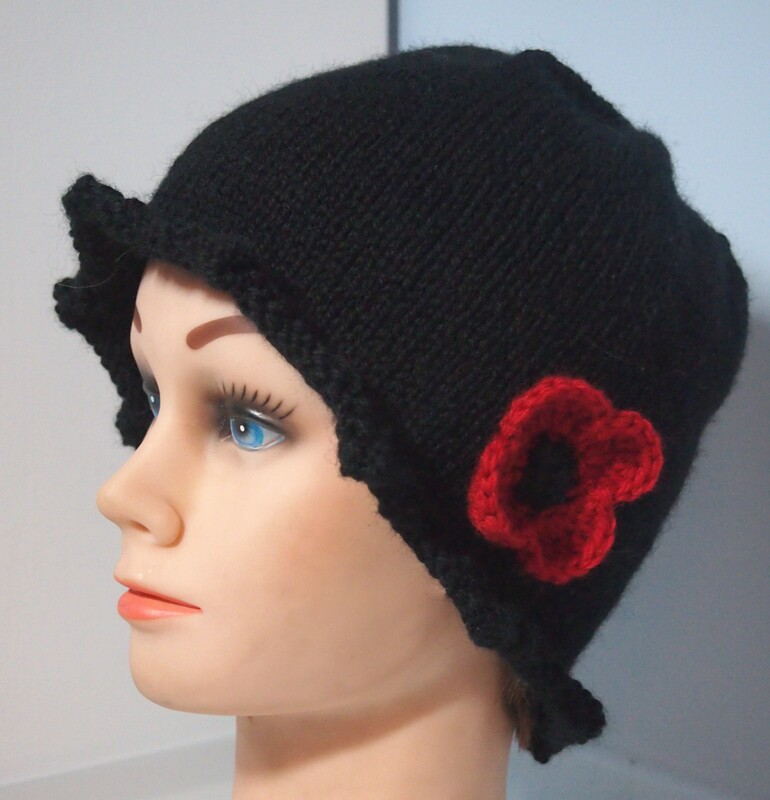 I then set about spending today knitting the second (unfelted) hat and making a scaled down crocheted poppy from my head. Now I am not sure which one is better. This entry was posted in felting and tagged felted hat, felting, knitted hat, knitting, Knitting and Crochet, Poppy, Remembrance Day on November 11, 2013 by gillianknitter. they’re both nice Gillian, but I prefer the knit one…it seems to fit better and snugger to the head. I like the felted hat Gillian, but the poppy on the unfelted one looked better. If it’s cold enough for me to wear a hat I’d want it to be a warm one. I know what you mean…and I will give it to the felted hat that it is warm, what it lacks in shape, it makes up for in insulation I guess. I put it on for a while yesterday when I was knitting and I had to take it off.